Circa 1877 oil on canvas by Edward Moran (Am., 1829-1901), titled The Winning Yacht, signed ($112,500). 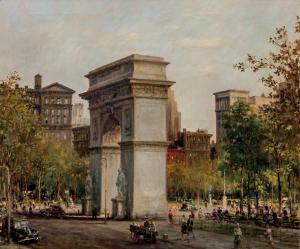 Oil on canvas by Alfred S. Mira (Am., 1900-1981), titled Washington Square Park, signed and dated ($81,250). 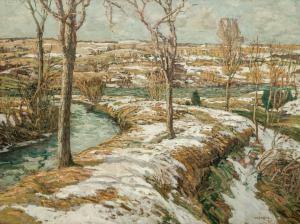 Oil on canvas by Walter Elmer Schofield (Am., 1867-1944), titled Winter Landscape, signed and dated ($75,000). Important American paintings from the 19th century through the contemporary era were available at Shannon’s semi-annual American and European Fine Art Auction. MILFORD, CONN., UNITED STATES, November 6, 2018 /EINPresswire.com/ — MILFORD, CT. – Important American paintings from the 19th century through the contemporary era were available during Shannon’s semi-annual American and European Fine Art Auction on Thursday, October 25, 2018 in Milford, Connecticut. Featuring 237 lots, the auction included quality examples of American Impressionism, American Coastal scenes and Modernism. 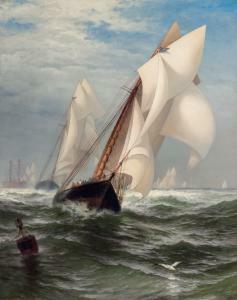 The top lot in the sale was a sailing scene depicting a New York Yacht Club race by Edward Moran. The price climbed quickly as phone bidders relayed bids against the internet and the room. In the end the work sold to a phone bidder for a remarkable $112,500. Shannon’s has historically achieved strong prices for scenes of New York City and this sale was no exception. Alfred Mira’s fresh-to-the-market view of Washington Square Park set a record, selling for $81,250 against a $25,000-35,000 estimate. There were several other notable sales including Walter Schofield’s large Winter Landscape, 45×60 inches, that sold for $75,000 to a buyer in the UK. A masterpiece quality painting by Monhegan artist Andrew Winter achieved a $42,500 sale price against a $20,000-30,000 estimate and a light-filled oil painting of a Red Barn in the Winter by Walter Launt Palmer brought $75,000. A unique offering in the sale was a William Wilcox On the Boardwalk, Atlantic City. The painting was in excellent original condition and attracted the attention of many collectors. It doubled the high estimate selling for $30,000. An A.F. Tait Solitude, Forked Lake, also in original condition, documented and exhibited sold for $37,500 against a $15,000-25,000 estimate. Among the 237 lots in the sale, there were a few sleepers that attracted the attention of bidders online, on the phones and in the room. A rare winter landscape by Hugh Bolton Jones more than doubled its estimate selling for $13,750 against a $3,000-5,000 estimate. There were over 15 bidders on the phones for the lot. Another sleeper was a small Peto still-life of grapes which sold for $9,375 against a $2,000-3,000 estimate. For the full results of the October 25th auction, visit www.shannons.com. Shannon’s produces an extensive color catalog, which is available for sale on their website (shannons.com) or by calling 203.877.1711. If you would like to join the Shannon’s mailing list, you can sign up on the website or email the gallery at info@shannons.com. Shannon’s Fine Art Auctioneers is always accepting quality consignments for future auctions. The next auction will be an Online Fine Art Auction in January 2019 followed by another cataloged Fine Art Auction in May 2019. To consign a single piece of artwork, an estate or a collection, you may call them at (203) 877-1711; or, e-mail at info@shannons.com. To learn more about Shannon’s Fine Art Auctioneers and the Thursday, October 25th auction, please visit www.shannons.com. Updates are posted frequently.